BIDDLE The Biddle family is of English descent. The first American ancestor, William, son of Michael Biddle of Elmhurst, Staffordshire, was born near London in 1630. It is thought that he was an officer in the Parliamentary Army during the Civil War in England. Shortly after its close he joined the Society of Friends and was imprison on account of this faith. His mother, Esther Biddle, was an eminent Friend and she also suffered many persecutions for the Truth's sake. In 1676 William Biddle purchased from William Penn and others a one-half share of the lands in Western Jersey, later adding to this amount until he owned 43,000 acres, and became one of the Proprietors of the Province, so after his persecution he sailed for his estate, leaving London, 1681. He became a man of great importance in the Province, being a Member of the Governor's Council, and of the General Assembly; was one of the Trustees selected by the Proprietors to conduct the business of the Proprietorsh8p; President of the Board of Trustees and held many other public offices. Before leaving London he married in 1665, at Bishopgate Street Friends Meeting, Sarah Kemp and their children were born in London. Their son William 2nd, was like his father, prominent in West Jersey affairs. He married Lydia, granddaughter of Eliakim Wardell, a member of the Assembly, who purchased lands at Newark from the Indians in 1666 and great granddaughter of Thomas Wardell, the Huguenot. The Biddles have always been socially and politically prominent. They have intermarried with the Craigs, Van Rensselaers, Drexels, Lees and many other well known families. CHISHOLM The Chisholms are of Anglo-Norman origin and after the Norman Conquest 1066, removed from England and settled in Scotland, where they founded an independent Highland Clan, the chief being known as "The Chisolm." The first of whom we have record is John de Chisholme, 1254, of Berwick, who married Emma de Vipount, daughter of William, Lord of Bolton, whose ancestor accompanied William The Conquerer of England. Their son Richard, in 1296, signed the "Ragman's Roll," and his son, Sir John de Chisholme, Knt., fought with Bruce at Bannockburn. His grandson, Sir Robert, is described as one of the "Magnates of Scotland" and was taken prisoner with King David II at Nevilles Cross, Durham, 1346. He married Anne, daughter of Sir Robert de Lauder, Constable of Urquhart Castle, Loch Ness. Five generations later Wiland de Chisholme, in 1509, was the first of the family to be designated "The Chisolm" and his son, John in 1538, had a Charter under the Great Seal of James V., erecting his lands into a barony. Colin Chisholm, progenitor of the house of Knockfin, John's gr. gr. grandson, redeemed for the Chief, the estates of Strathglass, etc. after they had been confiscated owing the the Clan taking past in the Rising of 1715. He married Mary, daughter of Patrick Grant of Glenmoriston, and the grandson, Alexander, married Janet, daughter of Fraser of Ballindorn and about 1717 emigrated to the Province of Carolina and settled near Charles Town. It was at the home of their great grandson, George Chisolm, called, "The Retreat" that Sir Richard Lee had his headquarters during the Revolution. At Beeston, Yorkshire, England, flourished an ancient family of Gale, alias Cooke. In history we read of Robert the Cook & his son holding the hereditary office of Masters of the Cook of Whitby Monastery abt the middle of the Twelfth Century. John the Cook, or John le Cok, represented Herfordshire in Parliament in the reign of Edward III, abt. 1350. Sir Anthony Cooke, grandfather of Lord Bacon, was so distinguished for his learning that he was appointed to preside over the education of Edward VI. Pope honored Thomas Cooke with a place in the "Dunciad" because, in his farce "Penelope." Cooke had ridiculed the poet's "Odyssey." Descendants of Francis Cooke may claim membership in the Mayflower Society, as he & his wife Hester came over in 1620, and he was one of those who signed the memorable Compact in the cabin of the Mayflower, Nov. 21, 1620. The progenitor of the Virginia branch of the family was Mordecai Cooke, whose 1st wife was slain by Indians in 1650; his 2nd wife was Joan Constable. He owned large tracts of land in Virginia and his son Giles is supposed to be one of the "Knights of the Golden Horse Shoe" of 1716. Many descendants of the family served in the Revolutionary and Mexican Wars, and all the world knows of James Cook, who circumnavigated the globe. Ardlock, or Crawford-land, in Ayrshire, Scotland, the castellated seat of the great house of Crawford, stands on the right side of River Clyde. The Crawfords were Caledonians and derived their lineage from the old Earles of Richmond. Reginald, youngest son of Allan, Fourth Earl of Richmond, was the extreme ancestor of the Crawfords. He was surnamed "The Good" and was heritable Sheriff of Ayr, an office long held in the family. He inherited Ardlock. Reginald de Crawford, The Good, was great-grandfather of Margaret, who married Malcolm Wallace and became the mother of Scotland's immortal hero, Sir William Wallace. 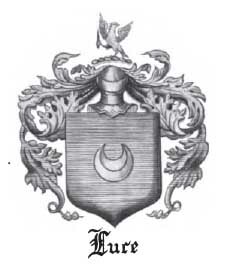 Thomas Crawford on April 2, 1578, captured from Sir James Fleming, Dumbarton Castle, at that time deemed impregnable, and the family crest was put on the wall, commemorative of this event. Kilburnie Castle and Kirk were ancient possessions of the family. The Kirk especially attracts, because on the front gallery are emblazoned the armorial bearings of twelve families with whom the Crawfords were allied. Ancestors of Colonel John Crawford, who came from Ayrshire to Pennsylvania lie buried in this Kirk yard. Three sons of Colonel John Crawford moved to Waxhaws, now Lancaster Co., S. C., about 1760. Joseph settled first in Edgefield, S. C., then in Georgia. Major Robert, born Pa. 1728, died Waxhams, South Carolina, Oct. 5, 1801 (an officer of the Revolution, who furnished a company at his own expense), married daughter of William and Sarah White. This family traces its lineage to Harderick, the first known Saxon King, B. C. 90; Anserie d. A.D. 1; Welka I., d. A.D. 30; Svartic I., d. 70; Svarti II., d. 80; Segward, until 100; Whitekind, King until 106; Wilke, King until 190; Marbod; Friga, Saxon King, conquered Denmark, Norway & Sweden & assumed the name of Odin. EGBERT, 19th descendant in direct line from Odin, was the first Saxon King of all England in 827. Egbert's son ETHELWULF, m. Osburga, a direct desc. of Cedric, and their son ALFRED, The Great, 850-901, was England's ideal king. The seventh direct descendant from Alfred, The Great, John de Sudeley, m. Grace de Traci, of Barnstaple Co., Devon. Their son WILLIAM, inherited his mother's estates and assumed her family name of de Traci. Sire de Traci, Norman Baron, fought at the Battle of Hastings, 1066 & his name appears on the "Roll of Battle Abbey." His son William was given the "Honour & Barony of Barstaple" by King Stephen, in recognition of his loyalty. His descendant, GRACE, m. abt. 1130 John de Sudeley (see above). Their son, Sir William de Traci, lived in the reign of Henry II & was one of the four knights who, at the instigation of Henry II, assassinated Thomas á Becket. His great-grandson, Sir William Tracy, was Sheriff of Gloucestershire during the reign of Henry VI. & Margery, dau of Sir John Pauncefort, Kt. Sir Wm. Tracy's great-grandson, RICHARD, wrote the remarkable treatise, "Preparations to the Cross." He m. Barbary Lucy, pupil of Fox the Martyrologist, & dau. of Sir Thomas Lucy, Kt. of Charlecote in Warwickshire. She was an aunt of Shakespeare's "Justice Shallow." Their son Paul Tracy was created a baronet June 29, 1611, by James I., being the 13th created from the institution of the Order." He had 21 ch. His 9th son, THOMAS, b. 1610, emigrated to America 1636, is known as Lieutenant Thomas Tracy & is the ancestor from whom the New England Tracys are descended. Among these are the Windslows, Ripleys, Mannings, Goulds & others. Judge James Gould, a direct lineal descendant of Thomas Tracy, with Judge Reeve founded the first law school in America. William Gorsuch, London, descended out of Lancashire nigh "Ormchurch," married Avice Hillson. Their son Danyell, Alderman's deputy of Bishopsgate Ward, who was living 1633, married Alice (1569-1638), daughter of John Hall of London. 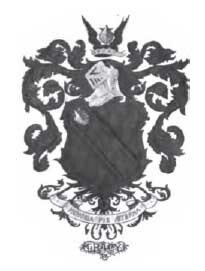 To this Danyell, was granted Arms by "Letters patents dated 1577 granted to Robert Hillson, of London, by Charles Cooke and continued to the descendants of "Gorsuch" to hear as their paternal coate." In the Chancel of Walkholme Church, Hertfordshire, there is a marble monument erected by Danyell Gorsuch in memory of his wife and in the same church in teh east window are four shields, Gorsuch in memory of his wife, and in this same church in the east window are four shields, Gorsuch, another charged with the Arms of The Mercer Company, of which Danyell was a member, Hall Arms, etc. Danyell's son John, Rector of Walkhorne in Hertford 1633, married Anne, daughter of Sir William Lovelace, of Kent, knighted 1609, and his wife Anne Barne. Sir William Lovelace was the son of Sir Williaml, knighted July, 1599, and Elizabeth Aucher, descended from Ealcher 1, Earl of KEnt of Bishopbourne, buried in Canterbury Cathedral. This Sir William was the son of Willialm M. P. for Canterbury, and his monument is in Canterbury Cathedral, and a direct descendant of Richard Lovelace of Queenshite, London, who in the reign of Henry VI purchased Bayford. Charles, son of Rev. John Gorsuch and Anne Lovelace, came to America with his parents and was in Maryland in 1661. He married Sarah, daughter and heiress of Thomas Cole, owner of Coles Harbour, a tract of 550 acres, where the City of Baltimore now stands. LOGAN Few surnames are more ancient than that of Logan. It early appears in Royal Charters in Scotland in 1278. In 1329 a knight, Sir Robert Logan, was in the train of barons who bore the heart of The Bruce to the Holy Land. In the reign of Robert the Bruce the principal branch of the Logan family obtained by marriage the Barony of Restalrig, lying between Edinburg and the sea, on which South Leith is now built. To such prominence did this family attain, that Sir Robert Logan, of Restalrig, married the daughter of Robert II by Euphemia Ross, and he was afterwards constituted Admiral of Scotland. The last Logan bearing the title of Baron of Restalrig was engaged in the Gourie conspiracy against timid James VI. After his death in 1606, his bones were exhumed, and a sentence of outlawry pronounced against him, whereby his lands of Fast Castle were lost to the family. In the battle with that Moors in Spain, in which "Good" Sir James Douglas was slain, another Sir Walter Logan lost his life also. There was an ancient Celtic clan of this same, while still another branch of this Logan lived in Ayrshire. Many Logans came to America and settled in both the northern and southern colonies. One of Pennsylvania's Colonial Treasurers was James Logan, long prominent in civic. Another James and David Logan went to Virginia and served gallantly in the French and Indian Wars. LUCE, LUSE, LUCI, LUCCI, LUCIE, LUCEY & LUCY. De Luci is the name of a Norman knight who accompanied William the Conqueror. He dropped the "de" and changed the "i" to "e"; thus in Scotland and England we find the name "Luce," in Italy "Lucca," and in Spain "Luccena." These names may all have been derived from "Luceres," the name given to the third part of the Roman people under Romulus. The de Luci have been seated at Norfolk for centuries, and the Lucys, who claim descent from the Norman de Luci, have name and fame in Warwickshire. Sir Thomas Lucy, of Charlecote Park, held grants under the Crown in the time of the Henrys and is supposed to be Shakespeare's "Justice Shallow, as he attained fame by prosecuting the immortal Bard for deer stealing. The first of the family in this country was Henry Luce, who, with his wife, Remember, was living at Martha's Vineyard about 1680. The Luces were among the founders of Nantucket; they were also established at Barnstable & Wareham, Mass. ; Canterbury, Conn.; Nottingham, N. H. and finally in New York. Many gave Revolutionary service. Descendants have intermarried with the Barnes, Bleekers, Collins, Crosbys, Cartwrights, Harlows, Holmes, Hoyts, Mortons, Robinsons, Tuttles, Howells, Hudsons & Terrys. 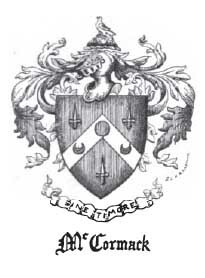 MacCormick, M'Cormic, MacCarmack & M'Cormac. The prefix "Mc" originally meant "son of," like "Fitz" in Anglo-Norman, & "O" in Celtic. One branch of the McCormick family traces back to St. David, King of Scotland, & Queen Matilda. Robert, the Bruce and James I. of Scotland, are also in this line. The progenitor of one branch of the American family was James McCormick, a signer of an address to William III & Mary, dated July 29, 1689. His two sons, Hugh b. 1695, & Thomas b. 1792, were Pennsylvania pioneers & their descendants went to Virginia & from thence to all parts of the country. John McCormick, b. Ireland 1748, d. Lock Haven, Pa., was a member of the militia which protected the frontier & through their son Robert, who bought 500 acres in Rockingham Co. in 1779. Robert, Jr., b. 1780, was the father of Cyrus Hall McCormick, whom, with his own hands, built the first practical reaping machine ever made. He was an Officer of the Legion of Honor & Member of the French Academy of Sciences. Stephen, b. 1784, Fauquier Co., Va., son of John & Elizabeth Morgan McCormick, was the inventor of the plow. In 1824, when presented him with a plow, which he took back to France and entered it in a plowing match, where it won the prize. Located in various sections of the country, the McCormicks gave patriotic service during the Revolution. 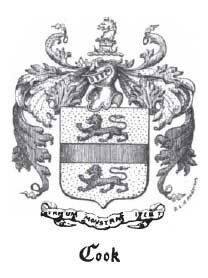 Their descendants are connected with the Halls, Morgans, Sandersons, Carters & Armstrongs. The Pierrepont family is of Norman origin. The earliest Lord of Pierrepont Castle, situated in the southern part of Picardy, was Sir Hugh de Pierrepont who flourished abt. 980. His grandsons, Sir Ingolbrand de Pierrepont, was the ancestor of the French family, and Sir Robert de Pierrepont accompanied William the Conqueror to England, took part in the Battle of Hastings and is mentioned in the Domesday Book as possessing the Lordships of Henestede and Wrethem in Solfolk. He was in the retinue of William, Earl of Warren and 1st Lord of the Manor of Hurst Pierrepont, which lay north of Brighton in Sussex.